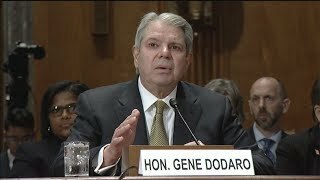 In June, we testified on what the Centers for Medicare & Medicaid Services (CMS) could do to address billions of dollars’ worth of improper payments and protect the Medicaid program from fraud. Medicaid continues to grow, and remains on our High Risk list due to concerns about the adequacy of federal oversight and the program's vulnerability to fraud. The number of recipients is growing. The 5 groups are: aged, disabled, children, adults, and newly eligible adults. GAO's work has identified three broad areas of risk to Medicaid program integrity as it reported in its June 2018 testimony before this Committee. For today's testimony, GAO provides examples of actions taken and plans by the Centers for Medicare & Medicaid Services (CMS) to address these areas of risk, and highlights additional efforts needed to strengthen program oversight. 1) Improper payments. To reduce improper payments and ensure only eligible individuals enroll, CMS plans to resume audits of beneficiary eligibility determinations and conduct new types of audits starting in three states. However, given the growth in Medicaid managed care, which was nearly half of Medicaid spending in fiscal year 2017, additional actions are needed to ensure that managed care payments are appropriate. For example, CMS still needs to establish processes to ensure that overpayments to providers are identified and accounted for by states when setting future payment rates. 2) Supplemental payments. Supplemental payments—which totaled $48 billion in fiscal year 2016—are payments made to providers in addition to regular, claims-based payments for specific services. Partially in response to GAO recommendations, CMS plans to issue a proposed rule in spring 2019 to establish new reporting requirements for supplemental payments. To address GAO's recommendations, the rule would need to clearly establish approval criteria and review processes to ensure these payments are economical and efficient, as well as arrange for more accurate reporting of how states are financing their share of these payments, among other things. 3) Demonstrations. Demonstrations—which made up one-third of Medicaid spending in fiscal year 2015—allow states and CMS to test new coverage and service delivery approaches. CMS recently limited states' ability to accrue unspent demonstration funds, resulting in an estimated $63 billion in federal savings from 2016 through 2018. Additional actions by CMS, such as ensuring demonstration budget neutrality—that demonstrations do not increase federal costs—and state evaluations of demonstrations are properly conducted, could result in significant savings and better informed policy decisions. As reported in GAO's June 2018 testimony, GAO's prior work has also identified the following fundamental actions needed to strengthen oversight. Improve data. CMS's Transformed Medicaid Statistical Information System initiative has the potential to improve program oversight, but more needs to be done to collect complete and comparable data from all states. Implement a fraud-risk strategy. CMS established the Center for Program Integrity to lead antifraud efforts and has required antifraud training for stakeholders. However, CMS still needs to conduct a fraud risk assessment and implement a risk-based antifraud strategy for Medicaid. Collaborate. Increased collaboration between the federal government and the states can help reduce improper payments. State auditors are uniquely qualified to partner with CMS in its oversight of Medicaid. CMS could help improve program integrity by providing state auditors with a substantive and ongoing role in auditing state Medicaid programs. Medicaid, a joint federal-state health care program overseen by CMS, is a significant component of federal and state budgets, with total estimated expenditures of $596 billion in fiscal year 2017. Medicaid allows significant flexibility for states to design and implement program innovations based on their unique needs. The resulting diversity of the program and its size make the program particularly challenging to oversee at the federal level. For example, in fiscal year 2017 estimated improper payments were $36.7 billion. Further, the Medicaid program accounted for about 26 percent of the fiscal year 2017 government-wide improper payment estimate. This testimony focuses on the (1) major risks to the integrity of the Medicaid program, and examples of actions CMS has taken to address these risks; and (2) other actions needed to strengthen oversight of the program. This testimony draws on GAO's reports issued between November 2012 and July 2018 on the Medicaid program, and information on a program integrity strategy CMS announced in June 2018. As a part of its body of work on Medicaid, GAO has made 86 recommendations to address shortcomings in oversight and suggested four matters for congressional consideration. CMS has generally agreed with these recommendations and has implemented 30 of them. GAO will continue to monitor implementation of the remaining recommendations.